Tissue: A group of cells which is formed to carry out specific task is called a tissue. Formation of tissues is the first step towards division of labour in multicellular animals. Subsequently, a group of tissues forms an organ and a group of organs forms the organ system. There are four major types of animal tissues, viz. epithelial, connective, muscular and neural tissues. Tissues which provide covering to the inner and outer linings of various organs are called epithelial tissue. The cells in the epithelial tissue are compactly packed. There is little intercellular matrix in the epithelial tissue. 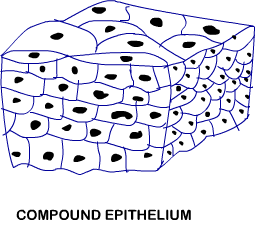 The epithelial tissues are further divided into two main types, viz. simple epithelium and compound epithelium. Simple Epithelium: The simple epithelium is composed of a single layer of cells. It is present in the lining of body cavities, ducts and tubes. Compound Epithelium: The compound epithelium is composed of more than one layer of cells. The compound epithelium serves the protective function. Compound epithelium is present in skin, in the lining of buccal cavity, pharynx, ducts of salivary glands and pancreatic ducts. The simple epithelium can be further divided into three types, viz. squamous, cuboidal and columnar. Squamous Epithelium: The squamous epithelium is made up of flattened cells with irregular boundaries. Squamous epithelium is present in the walls of blood vessels and air sacs of lungs. 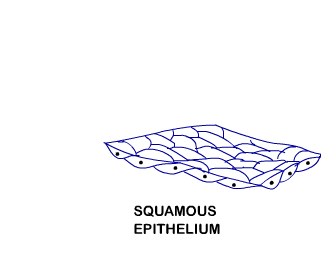 They form a diffusion boundary. Cuboidal Epithelium: The cuboidal epithelium is composed of cube-like cells. The cuboidal epithelium is usually found in ducts of glands and tubular parts of nephrons. The main functions of cuboidal epithelium are secretion and absorption. Columnar Epithelium: The columnar epithelium is composed of tall and slender cells. 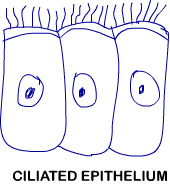 The nuclei of the columnar cells are located at the base. Microvilli may be present on the free surface. Columnar epithelium is present in the lining of stomach and intestine. They help in secretion and absorption. Ciliated Epithelium: Sometimes, cilia may be present in columnar or cuboidal epithelium. In that case, they are called ciliated epithelium. The cilia move particles or mucus in a specific direction over the epithelium. They are present in the inner surface of hollow organs; like bronchioles and fallopian tubes.